In 1 Samuel 15:22, king Saul disobeyed the instructions of the Lord and in turn opted to honor God his own way by offering up sacrifices to none other than God Himself. Doing so did not please God, but angered Him. When the prophet Samuel saw the king, and he attempted to explain away his actions, Samuel said, “to obey is better than sacrifice.” In other words, God takes no pleasure in us tossing Him a spiritual bone. He takes no pleasure in our disregard of His instructions and rationalizing motives for doing so. The byproduct of king Saul’s disobedience was the eventual loss of his kingdom (1 Samuel 15:28). Failing to see God for who He is, the Almighty Creator and Sustainer of the universe, and thereby approaching Him as a peer, or worse yet, the old dog waiting on our scraps, may be fashionable for some today, but it is not acceptable to God Himself. True obedience and worship is not something accomplished by embracing and fulfilling a religious formula–attend church, read the Bible, pray and give to the needy. Rather, it is a way of life. It is seeing God for who He is as described in the scriptures. It is approaching Him with the respect and humility worthy the Almighty Creator and Sustainer of the universe. It is maintaining a lifestyle that is inwardly and outwardly harmonious with His teachings, not out of compulsion, but from a heart of love and thanksgiving! Psalm 105:1-7 establishes four things that must be present in our lives that validate a sense of daily worship and thanksgiving before God. The psalmist begins by encouraging us to offer up praise to the Lord. The praise he is referring to does not demand taking part in a “worship service” or going to a church building. We can sit in the most beautiful church from dawn to dusk and fail to truly praise the Lord. To truly praise Him we must have a willing and humble heart. We must see God for who He is, and see ourselves for who we are in relation to Him. God’s presence is everywhere, and thus, we can rest assured that we can offer up praise to Him without limits or conditions. In what ways can we offer up praise to God? Psalm 105:1 encourages us to “Give thanks to the Lord.” We can praise Him by offering up heartfelt thanksgiving to him. In verse 2 it says, “sing to Him.” This is not referring to just any sort of song, but songs and hymns of praise to Him. David also adds in verse 3 “Let the hearts of those rejoice who seek the Lord!” The culmination of praising God ought to lead us to rejoice in Him and all He has done for us. Praising God is a beautiful and wonderful thing. It helps us turn from our natural inclination to be self-focused, to God focused. In doing so, we set in place proper order and balance in terms of our spiritual relationship with our Creator and Sustainer. And in the process, we see ourselves for who we are, and we see God for who He is. Praising God is essential to a healthy spiritual foundation, but it must not stop there. Verse one adds, “Make known His deeds among the peoples!” We are called to share the greatness of the Lord with others as well. We are called to share His deeds among the assembly of believers. This can be done during informal times of fellowship with other Christians or even during more formal times of worship in our local assembly if permitted. As we go forth into our communities and beyond, we are to proclaim His “deeds” and “teachings.” Of course, we should never push or peddle God’s Word, but share with a hearts of love, grace and patience the Lord afforded us. As with praising and proclaiming God, praying to Him can be done anywhere. We do not have to be sitting in a church building to pray. We can be resting in a bed, driving in a car, at work or play. Simply put, prayer is talking to God and we can talk to him anywhere, in any position. When the Lord’s good friend Lazarus died, He went to the place where his body laid, spoke to his sisters and prayed. In John 11:41-42 it says, “And Jesus lifted up His eyes and said, ‘Father, I thank You that You have heard Me. 42 And I know that You always hear Me, but because of the people who are standing by I said this, that they may believe that You sent Me. '” Amid the people gathered, during a challenging time for all, Jesus spoke aloud to His Father that others may appreciate what was about to happen, the resurrection of His friend from the dead. Similarly, in Luke 22:41-44 we see an example of this when Jesus withdraws to Gethsemane to spend time in prayer prior to His betrayal. Jesus knew what was coming. Rather than filling His time with something else, He spent these precious moments in prayer. In both instances, Jesus did not choose to go to the Temple to pray, rather He prayed in common locations. He prayed privately and before others as well. The first detail is that Jesus encouraged His followers to pray while on the Mount with Him. In doing so, He reinforces the fact that prayer goes beyond formal places of worship such as the Temple of His day or the churches of our day. The proximity of one’s prayers wasn’t an issue to Jesus or His followers. The second detail the passage establishes is that Jesus prayed often. It says, “Coming out, He went to the Mount of Olives, as He was accustomed.” Jesus, the Son of God, went to the Mount often to pray. It was a regular part of His life. He got away from the daily demands of the world to spend private time with His Father. For those of us who have embraced Christ as Lord and Savior, surely His example challenges us to pray often and regularly. Indeed, we are without excuse. We are not limited by proximity, because God isn’t limited by it. We are not limited by time, because God makes Himself available to us both day and night. We are not limited to subject matter. The psalmist encourages us in verse 4 to “Seek the Lord and His strength,” Just as the Father welcomed the burdens of His Son when He cried out in Luke 22:42, “Father, if it is Your will, take this cup away from Me” (the cup being the cross and all that went with it), He too welcomes our burdens. God has removed all impediments to worshipping Him through prayer. What a blessing and reason for true thanksgiving! The last thing we must strive to incorporate into our daily worship and thanksgiving is to ponder the Lord Himself. Psalm 105:5 says, “Remember His marvelous works which He has done, His wonders, and the judgments of His mouth.” We are encouraged to think about God and His “marvelous works,” His “wonders” and His “judgments.” It is not enough to praise, proclaim and pray to Him. We are likewise encouraged to “remember” Him in all facets of our relationship with Him. This cannot be stated any more clearly than the instruction given to Israel in Deuteronomy 6:6-7. There it says, “And these words which I command you today shall be in your heart. 7 You shall teach them diligently to your children, and shall talk of them when you sit in your house, when you walk by the way, when you lie down, and when you rise up.” From God’s perspective, remembering Him and His Word is an all encompassing aspect of life itself. Remembering God and His ways can be a great encouragement to us in seasons of blessing and seasons of want. Remembering God and His ways can teach and reinforce important truths concerning Him. Remembering God and His ways can encourage sobriety as we struggle with life in this world. Pondering the marvelous works, wonders and judgments of the Lord are central to a balanced walk with Him. 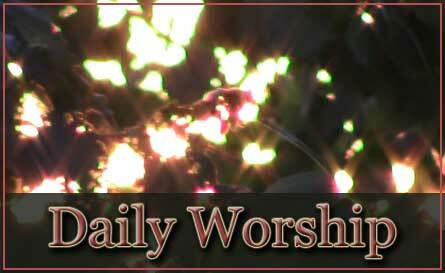 In closing, daily worship is not an option, rather, it is a necessity. When we struggle and stray from the Lord, undoubtedly, daily essentials such as praising, proclaiming, praying and pondering are lacking in part or in whole. Let us draw close to the Lord and daily embrace those things He has given us to help us stand firm in Him and find true blessings as we walk with Him.